You would never guess my older boys came from a climate where 75 degrees was considered freezing cold. After I gave them the green light to go outside I had to laugh to myself. A big smile came on my face as it brought back the memory of them seeing snow for the first time almost four years ago. It was our first night home as a family of four and nobody slept. Everything was so new for the boys, excitement, nerves and not to mention their clocks being completely messed up with the time change, so we were all up for the day at 3:00am. 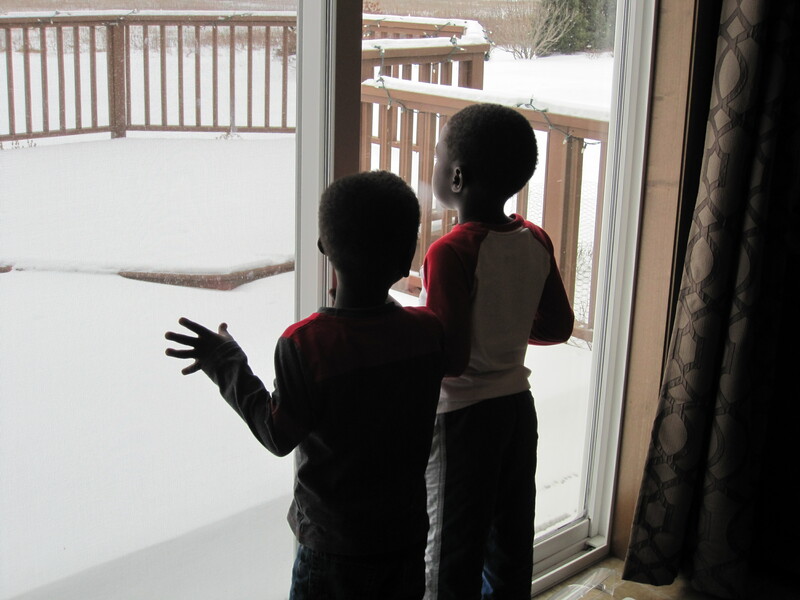 Two little boys peering out our patio window mesmerized by the sight of snow and begging to go out in it. Dressed in their snow pants at the first sign of daylight shining through. The past almost four years have been such a whirlwind we literally became an instant-family, I haven’t seen the movie yet but pretty sure it could have been our story. Our travels to Ghana seem like forever ago yet still the time has been so short and I often forget and take it for granted. With Adoption Awareness month practically at a close I ask myself what am I doing to bring awareness, how is our family living out adoption the beauty, the heartache, the joy and the trials. I have been reading a lot of stories of adult adoptees over the past few weeks and it made me realize that somewhere in their hearts is a loss that I am not the answer to, but one God willing that I can walk along side and only help them heal from. Every adoption comes from a loss, a loss of not being with their biological family. For International adoptees even more so it is a loss of country, heritage and language. A loss that is met with confusion and often times more questions than answers. A longing to know more, to go back to what is familiar. Is adoption hard, yes. Is adoption beautiful, absolutely. Are there moments where I wish attachment were easy, second nature and something I didn’t have to work so hard at. The moments can be trying and heart wrenching, but not in an instant does that change my advocacy for adoption. Not for a split second do I ever question the goodness that adoption can bring to a broken life, the security it can provide, the healing that can take place and the love given. I would be remiss to act like everything is sunshine and lollipops, but to not advocate for adoption of those in need, abandoned, abused, orphaned would be just as wrong. As a believer I hold in my heart that I am my brother’s keeper, as Christians we are called to care for the orphans because every child deserves a family.